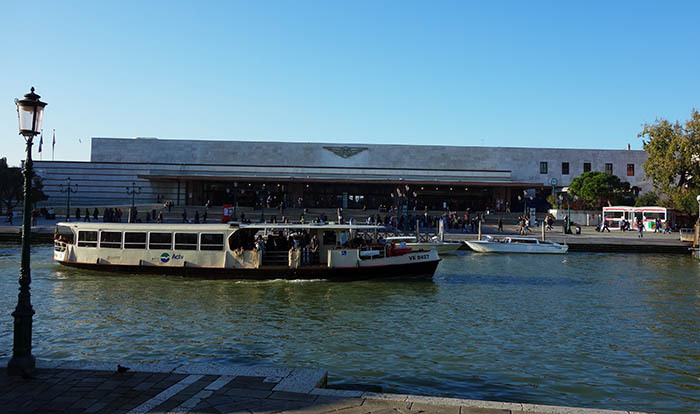 We were leaving Venice in the afternoon of November 19, but before we left, there was still a lot to see. On the agenda for the day was another visit to Basilica San Marco, the Frari Church, and another ramble through twisted Venetian streets. View from ferry station. Sure is nicer than the subway. We’d visited the Basilica briefly for a quick tour. But frankly, it’s tough to get a feel for these large buildings. Of course, you can appreciate the scale and the artwork, or just contemplate the space. But on the other hand, they can feel impersonal. So, we decided to return with an audioguide. We used Rick Steves. I remember watching Rick Steves on PBS as a kid, and enjoying his travel shows. Hardly extreme, and Rick seems perfectly tailored to appeal to middle-aged women. But he’s also smart and a diligent guide, and can have a cheesy sense of humor. We’d use him for other tours as well. We also wanted to check out the Basilica’s museum. 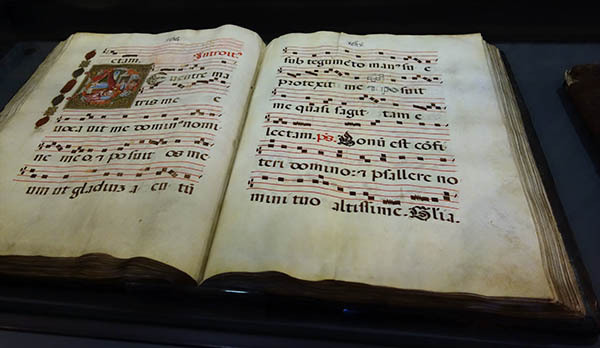 Among other things, the museum shows artifacts associated with the museum, provides a great view of the Basilica and the Piazza, and has some very special horses. After heading up some steep stairs, the museum opens up and looks over the main nave of the church. This area was the only area, until recently, where women were allowed to sit for services. We made our way around the upper corridors, which ring the building. It’s very interesting to get an up-close view of all the mosaic tiles – much more impressive than from the ground; it was easier to appreciate the scale. The museum also shows tapestries, books and samples of sheet music (as well as a few incongruous modern art pieces). 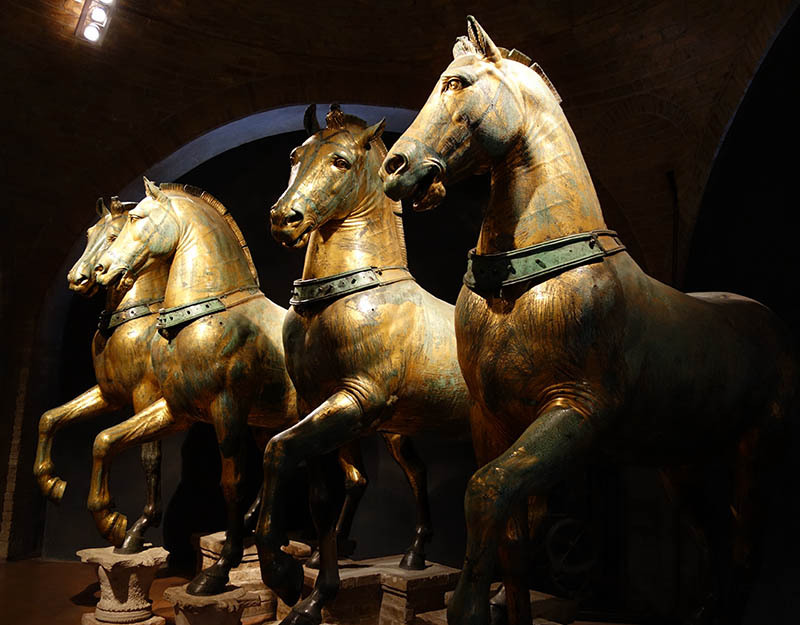 Far and away the highlight, for me, was the set of four gorgeous bronze horses. These horses are of unknown origin. They probably date from around 300 BC, but nobody knows for sure. For a long time they stood above the Hippodrome in Constantinople. 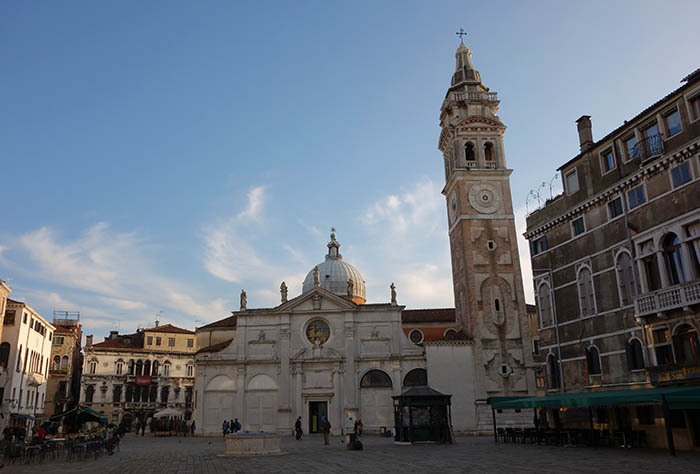 When the Venetians sacked the city in 1204, they carried them off and put them on top the Basilica, where they remained for almost 600 years. Then Napoleon briefly brought them to Paris, where they were used to design the Arc de Triomphe. 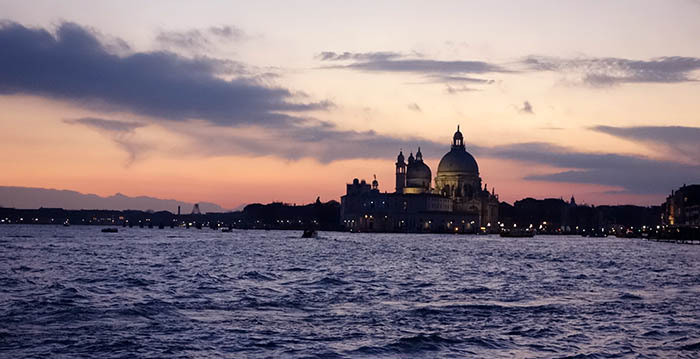 After Waterloo, they were returned to Venice. Now they reside in the museum (replicas are outside). If you’ll excuse the digression, the horses spur a romantic or nostalgic feeling in me. They’re real treasures, but even more beautiful than their physical appearance is what they represent. When the Venetians sacked Constantinople in 1204, they didn’t do it along: they were accompanied by Franks. 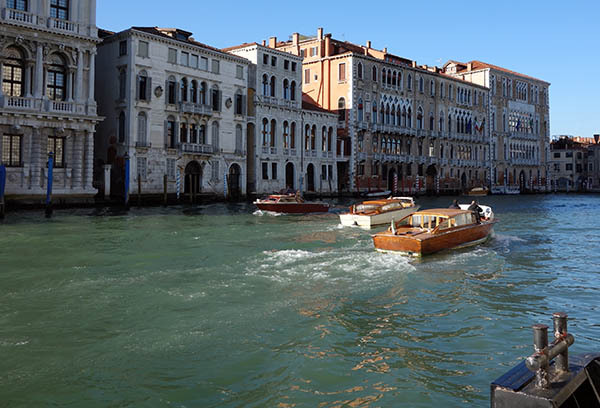 The Venetians stole jewels and beautiful artistic works. The Franks destroyed things and melted them down. Constantinople, before the sack, was the jewel of the world, notably beautiful, cosmopolitan and splendid. Afterwards, its treasuries empty, its slow decline accelerated. Unable to pay for its wars or defense, it rapidly collapsed into a single nigh-impregnable city before finally being conquered by the Ottomans in 1453. Looking at the horses, I felt a connection with the vast disappeared riches of antiquity. When these cosmopolitan cities were conquered, their treasures were destroyed or looted, and with them, an irretrievable part of western culture. So it was with Constantinople, and so it was with Alexandria, Knossos, Carthage and Rome itself. Now we only see scattered fragments. 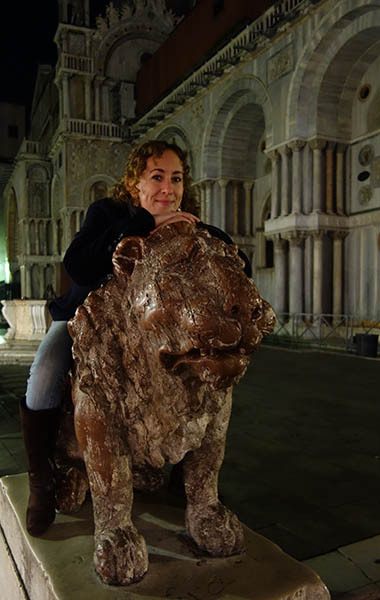 After the horses, we went out to the balcony for a great view of Piazza San Marco and the Doge’s Palace next door. Along another side of the Piazza was the Correr museum. 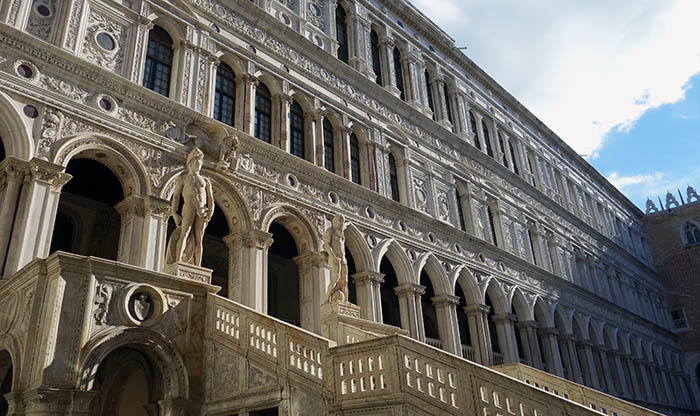 This gallery is filled with Venetian artwork and artifacts, as well as fairly large collection of Roman artifacts. 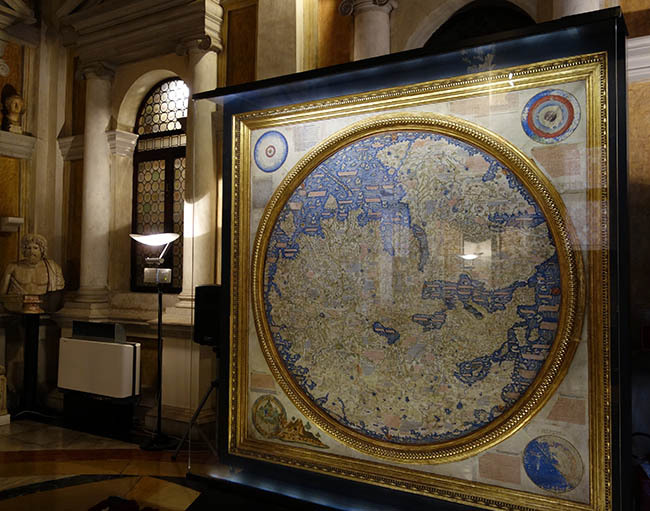 One notable work here was the famous Fra Mauro map. This map, created in 1450 by the monk Fra Mauro, contains the total geographic knowledge of Europeans at the time. The perspective is peculiar, but Italy is plainly visible, as well as Africa, Saudi Arabia, and the rest of Eurasia. It gets increasingly distorted the further you get from Europe. The best part of this map is the tiny annotations and descriptions of each area. The map itself is large, probably about 7 feet by 7 feet, and it dominates the room in which it stands. We’d actually get a closer look at a replica a few days later in Florence. And after the trip, I received a copy of the map as a gift, so I can also see it on the wall of my apartment! We ended up doing a pretty quick run through the Correr, being a bit museumed out by this point. Then we took a ferry across the grand canal to make a stop at the Frari Church on the way to the train station. This was actually one of my favorite churches in Italy. The architecture is nice, but there’s a lot of miscellany around the church that’s interesting. Of particular interest are the tombs of Titian, the famous painter, and Canova, the great sculptor. 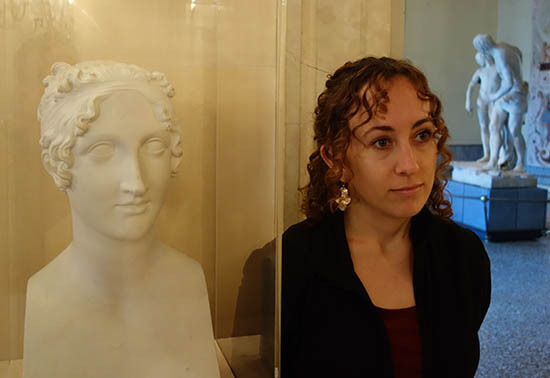 In fact, Canova’s tomb is quite peculiar. The tomb, a huge pyramid, is more laudatory than evena normal tomb, and it was designed by Canova himself – but for Titian (for whom it was never used). After Canova died, his disciples used the design for his own tomb. But here’s the thing: his body isn’t even buried in the tomb. His heart was removed and placed in an urn inside; it’s the only thing in the enormous edifice (his body is buried in his hometown). I wasn’t allowed to take pictures in the church, unfortunately. After the Frari Church, we stopped nearby to get some really excellent gelato. Given that the church is a well-known tourist site, the gelato was awful cheap (~2.50 EUR). We did some more wandering before ending up at the train station. We rested on the other side of the canal, before heading in to grab tickets to Florence. This entry was posted in Italy on January 1, 2015 by rob. 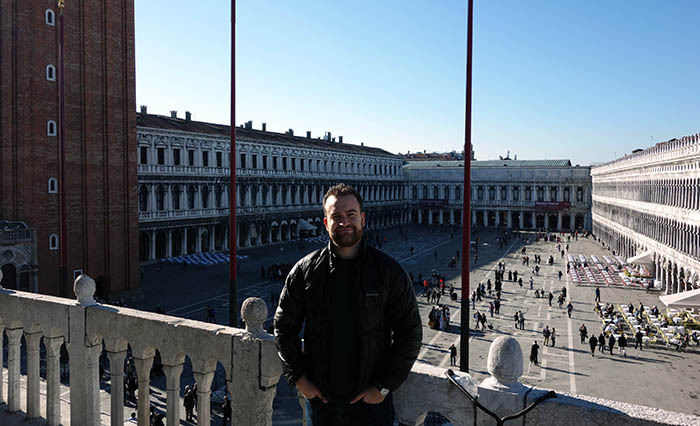 We spent most of our second day near the Piazza San Marco. 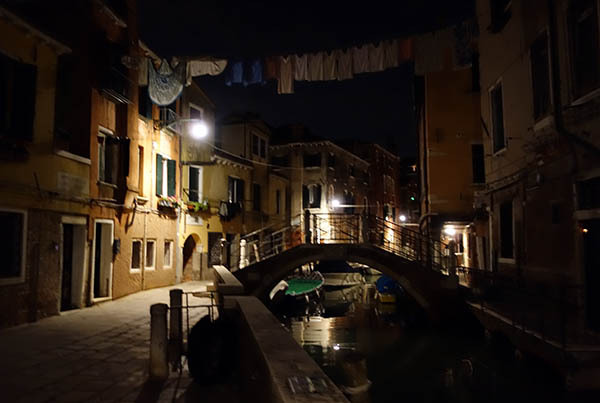 This is the tourist center of Venice – in fact, it has all the really notable landmarks. 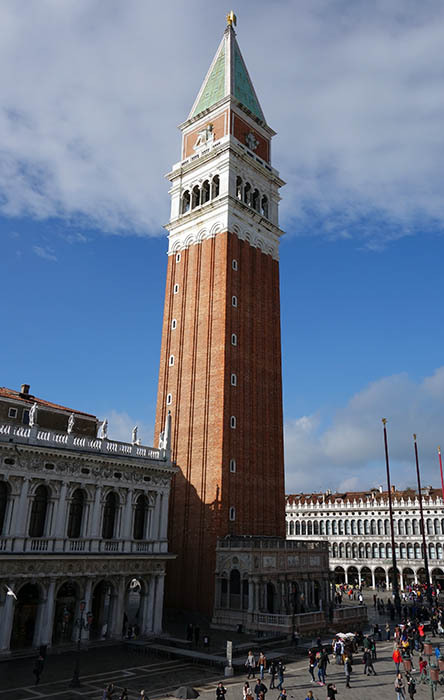 These are: St Mark’s Basilica, the Doge’s Palace, the Correr Museum, and the Campanile (belltower). The first stop was the Basilica. The entire entrance was still flooded after the previous night, so we had to enter via the elevated walkways. The entire inside of the basilica is coated in gold leaf and mosaics of biblical scenes. Venice had heavy interaction with Constantinople (they sacked the city and stole all the artwork during the fourth crusade), and as a result the decoration feels decidedly more Byzantine than Catholic. St Mark’s is also remarkably old: it was built starting around 1073, and has been mostly unchanged for almost a millenium. It feels old – much more ancient than, for instance, the cathedral in Milan, which had a purely medieval feel. The basilica holds the remains of a saint (like any basilica). 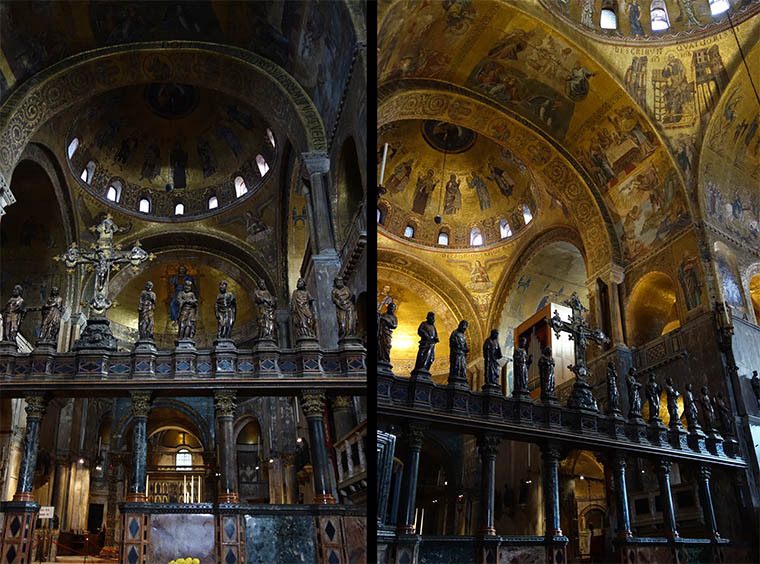 In this case, the remains of St Mark, for which it’s named. At least, it’s reputed to hold the bones of St Mark. They were recovered from Alexandria by Venetian merchants, who hid them in pork barrels to prevent the Muslim rulers from finding them. 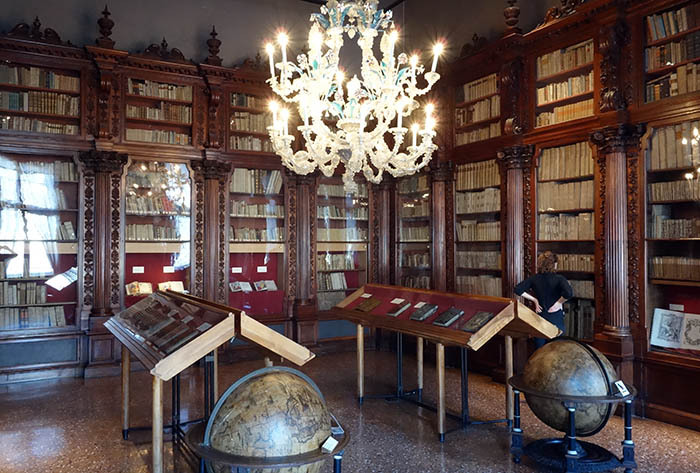 Then they were misplaced, and conveniently recovered – now a thousand years old – by a doge of Venice. There’s at least one theory that the bones are those of Alexander the Great. The most you can say for sure is that someone is buried in St Mark’s. We just did a walkthrough of the Baslicia (we’d return the following day). Partway through they turned on the lights, and wow! what a difference. With lights, the Basilica glowed and shimmered. But, I don’t know which look was more authentic. Would the basilica have looked that bright 800 years ago? Hard to say for sure. Adjoining the basilica is the Doge’s Palace (in fact, the doge had a private entrance into the basilica). All the tour books had recommended visiting this building, but from the outside it was hard to see why. A pretty-enough building, with the usual Byzantine flair, it looks bureaucratic and rather dull from the outside. That all changes inside. There’s a pretty courtyard, with a stunning marble staircase (the “Giant’s Staircase”). On the second floor surrounding the courtyard was a temporary open-air Le Corbusier exhibit. The only thing I know of Le Corbusier is that he bound a copy of his favorite book (Don Quixote) with the skin of his favorite dog. So sentimental. There was a also a nice view of St Mark’s Square and the Campanile. The next part of the palace is the doge’s apartment. 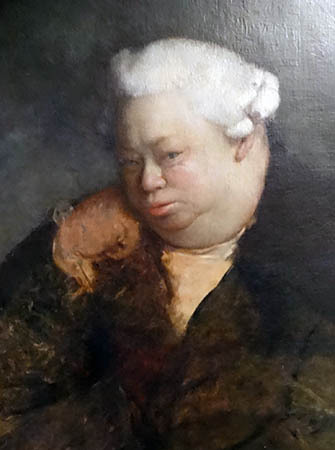 It’s extensive, and I suppose that was a necessity, because the doge could only leave the palace with the express permission of the Venetian senate. There were some nice paintings but my favorite part was the enormous map-room, covered with huge, detailed maps of the entire known world. Not to mention some great globes. This was all well and good, but the next few rooms were increasingly memorable. These were the ‘Institutional Chambers,’ the rooms where the city’s politicians met and deliberated. It’s worth remembering that Venice was the dominant merchant power in Europe for roughly 300 years, from the time of the fourth crusade (1200) through the discovery of the Americas and Vasco da Gama’s sea-route from Portugal to India (which eliminated Venice’s monopoly on the spice trade and at a stroke turned the city into a second-class citizen). In all, Venice was a player in European politics from the twelve century through 1797, when it was conquered by Napoleon. 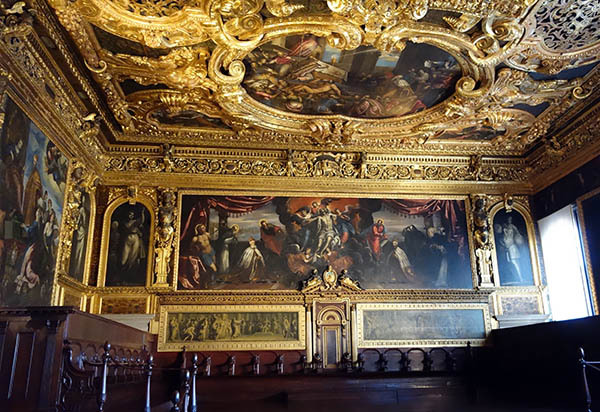 The doge’s palace is carefully partitioned so that visitors are led through increasingly large and ornate rooms – rooms whose walls are covered in world-class paintings, and whose ceilings are encrusted with enormous gold coils and frames and more paintings. It’s really astonishing. 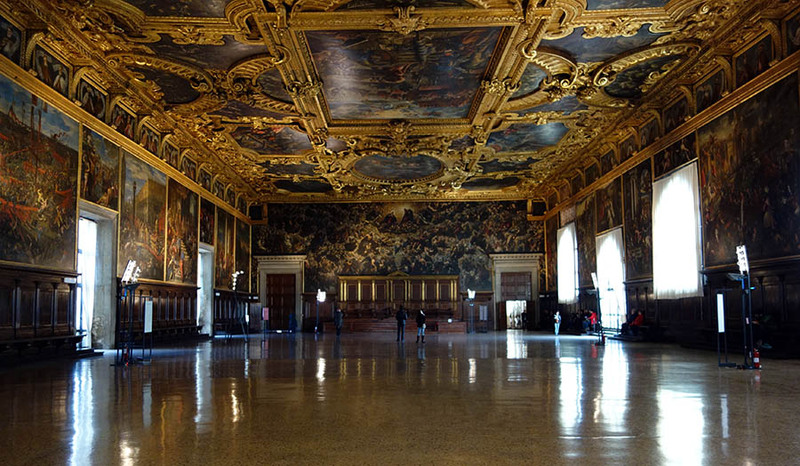 My two favorite rooms were the Sala del Senato, the senate room – this is the first really large room you see. But it feels positively tiny a few rooms later when you enter the Chamber of the Great Council. Great Chamber. the tiny figure in the middle is Alex. The Chamber of the Great Council is 25 meters across, and 53 meters long. It feels much larger. For centuries, it was the largest room in Europe. 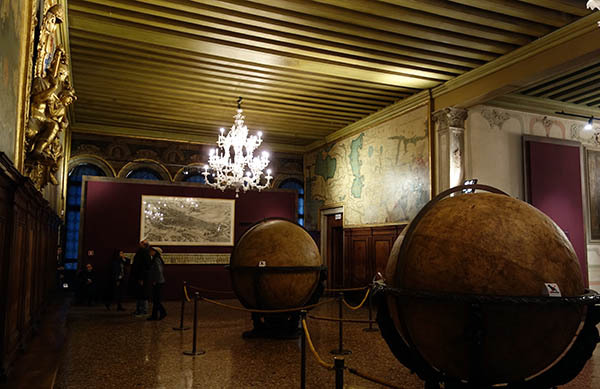 The walls are decorated with paintings by Bellini, Titian and Tintoretto (to name a few). The ceiling is ornate. We spent 15 minutes in this room, trying to come to terms with its size. The wall behind the doge’s seat is covered with the largest canvas painting in the world, Tintorretto’s Il Paradiso Photographs simply don’t do this room justice. 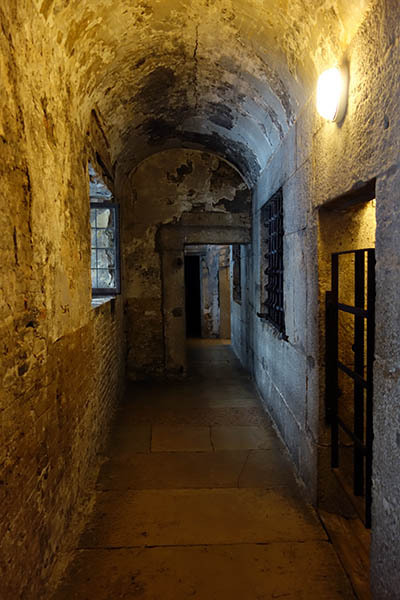 After this, we walked through the Bridge of Sighs – where criminals were led to the prisons after sentencing, and sighed at beauty of their last look at Venice (or so they say). And then the prisons, which were rather conventional, but cool and moist. I wouldn’t want to spend much time there. 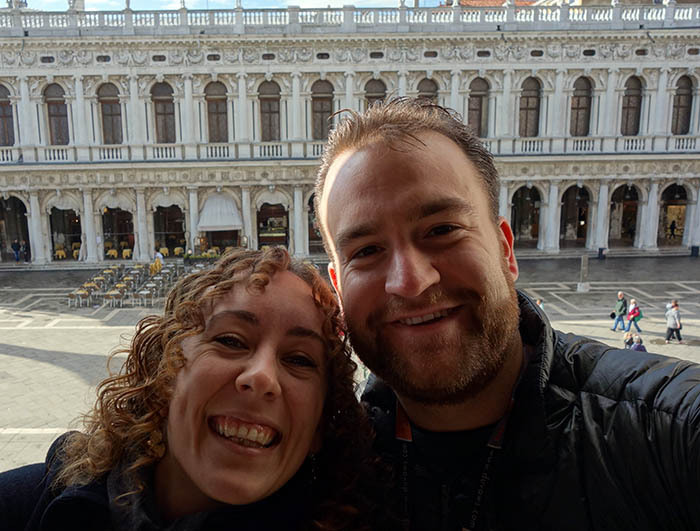 After the Doge’s Palace – we finished the tour at 3pm – we grabbed a lunch nearby (not great, very touristy), and regrouped at our apartment. Then we headed out to visit San Giorgio Maggiore. This island is a 3-minute ride from the main city, and has a beautiful view. By now, it was dark, so we could see all the lights of the city’s churches, cafes, restaurants and hotels. We had a huge church to ourself, and walked around the island a bit before heading back. Next we walked east outside the tourist area to the more residential districts, and the small, secluded San Pietro island. We took the ferry boats around a bit and accidentally visited the outer islands (whoops), before returning. On the way back to our apartment, we got a bit lost. But on the plus side, I got to try fernet for the first time (yuck), and Alex got to try meringue cookies (which I love). We also got some gelato before returning to the apartment to rest up for the next day, where we’d revisit some of the major sites before heading to Florence.